Persistence Market Research has come up with a new exhaustive research report on the global ePRO, e-patient diaries and eCOA market. The report titled ‘ePRO, E-Patient Diaries and eCOA Market: Global Industry Analysis 2012 – 2016 and Forecast 2017 – 2025’ gives a clear insight on the developments in the market and provides a revenue forecast for the period 2017 to 2025. The report is structured in a manner that it covers every aspect of the market including the drivers positively impacting revenue growth, trends that are governing the market and also the restraints that are limiting the growth of the global market. The analysis is based on these factors that are influencing the market in one way or the other and the results prove to be very useful for businesses that are focusing on their expansion in this market. Advancements in technology have caught up in a big way in the global healthcare industry. Doctors and healthcare professionals are seen experimenting with new and advanced instruments and are also adopting new methods of treating their patients, owing to an increase in the number of patients and mass casualties. The global ePRO, e-patient diaries and eCOA market is experiencing an exceptional growth. This software can help in connecting with multiple channels to provide enhanced communication services in healthcare. The ePRO technology is an electronic patient reported outcome that is collected by electronic devices such as smartphones, tablets and computers. Similarly eCOA also uses smartphones and other electronic devices to collect patient related data. With the increase in demand for smartphones there is also an increase in the demand for technologies such as ePRO, eCOA, etc. People prefer generating electronic data for their reports owing to the various inherent benefits such as elimination of data duplication, reduction in transcription errors, real-time data access, and accuracy of the data generated. These technologies have also improved patient compliance due to the provision of new apps that connect patients with doctors anytime and anywhere. The convenience offered by these technologies helps maintain the user engagement as well. Advancements in technology are typically accompanied by security and privacy concerns. In clinical communication and collaboration solutions there is a risk involved with the generation of health data. Global healthcare security policies dictate that patient data should be accessible only to doctors and other hospital authorized staff. But technological advancements open the gates for many fraudulent activities and cyber-attacks, some of which are inevitable. Technologies such as ePRO, e-patient diaries and eCOA also decrease the rate of human interaction exceptionally. Patients these days are more inclined towards virtualized treatments. Lack of direct contact between patients and healthcare professionals increases the risk of errors in clinical services delivered to the patients. At times, patients can face grave issues such as healthcare services being delivered by inexperienced professionals in the healthcare industry using such faceless technological platforms. By type of solution, the eCOA segment is anticipated to be the largest with an estimated market share of about 66% in 2017 and 2025. In terms of value, the eCOA solution type is anticipated to increase 3.1X between 2017 and 2025. eCOA is also projected to be the dominant as well as most attractive type of solution in the global ePRO, e-patient diaries and eCOA market during the forecast period. The report focuses on the performance of the different segments of global ePRO, e-patient diaries and eCOA market across various regional segments. According to the outcomes of the analysis, North America is expected to dominate the global market throughout the forecast period. Among the solution types, eCOA leads the market in the North America region with ePRO being the most lucrative sub segment. The market of eCOA in North America is anticipated to hold a value of US$ 307 Mn in 2017 and this is expected to reach just under US$ 945 Mn in 2025. The growth of eCOA is largely contributed by the ePRO sub segment, which is anticipated to reach a market value of around US$ 339 Mn in 2025. 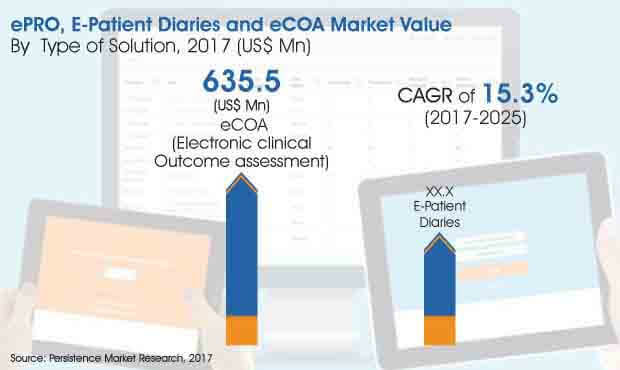 However, the e-patient diaries market is expected to be a tough competitor to the eCOA market in the North America region in terms of CAGR during 2017-2025.